Winton, a rural town, is 750 km west of Rockhampton on the Landsborough Highway between Longreach and Cloncurry. The Winton district was traversed by three exploration parties to search for members of the Burke and Wills expedition (1861): Frederick Walker, in the Aramac district and the headwaters of the Thomson River; John McKinlay, along the Diamantina watercourse, west of Winton; and William Landsborough, along the Flinders and Barcoo watercourses, also west of Winton. Their reports led to pastoral occupation during the mid and late 1860s. By the mid-1870s, pastoral stations occupied most of the district, necessitating a postal delivery system for regular communication. A former police sergeant from Aramac, Robert Allen, opened a hotel/store in 1876 at Pelican Waterhole, a convenient transit point for mail deliveries. He renamed the place Winton, probably after a village 3 km north of Bournemouth, England. Another hotel, the North Gregory (the name of the pastoral district) was opened in 1878. The Winton town reserve was gazetted in 1879. With a population of about 150 and numerous pastoral employees in the district, Winton established a hospital in 1882. Three years later a primary school was opened, and a newspaper, the Winton Herald, began publication in 1886. The Winton local-government division was proclaimed in 1886. 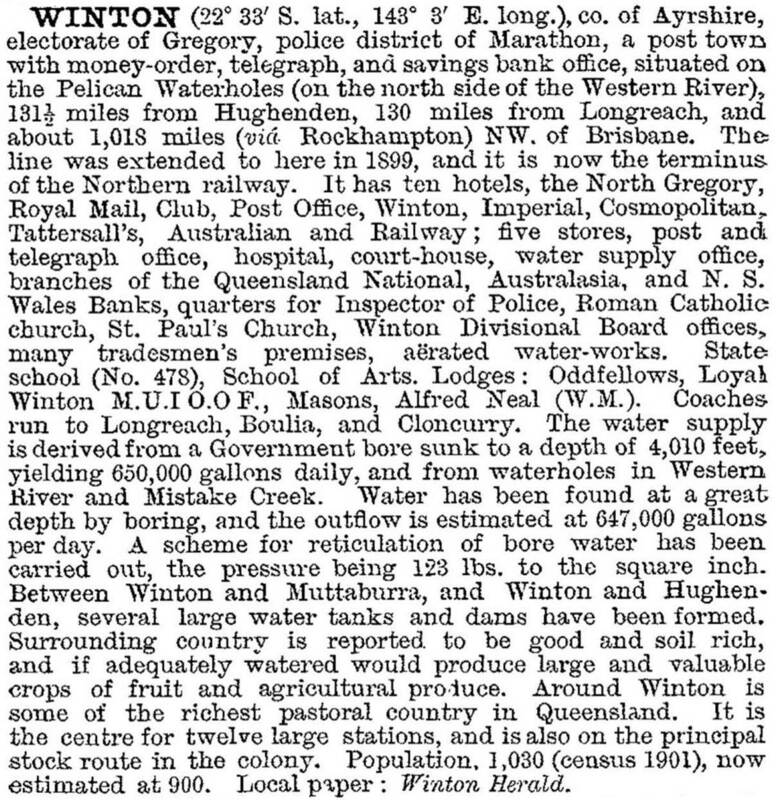 During the mid-1890s Winton's outback remoteness lessened. The railway out of Townsville reached Hughenden in 1887, and the line out of Rockhampton reached Longreach in 1892. Cobb and Co coaches ran services further west. In 1895 Andrew Barton 'Banjo' Paterson was a popular poet. He visited the outback Dagworth station, 100 km north-west of Winton where he heard Christina Macphearson play the tune 'Craiglea'. Impressed with its rhythm, Paterson wrote words to accompany it, basing the verses on a story told locally about the misadventures of a swagman. Thus was 'Waltzing Matilda' written, and performed at country gatherings before its first public performance at the North Gregory Hotel on 6 April 1895. Winton's economy was dependent on pastoral prosperity, which went in step with drought periods and good seasons. Some droughts were severe, in 1902 and later in the 1930s. During better times improvements were made: a Catholic school (1911), the town's first moving picture show (1913) and an attractive shire hall (1914, but damaged by fire and replaced by a utilitarian structure in the 1960s). Remoteness was still significant when youthful aviators and local promoters registered Qantas in Winton and held their first company meeting in the Winton Club in 1921. Qantas later moved to Longreach, to which Winton was connected by another railway extension in 1928. Pastoral traffic then had a choice of either Townsville or Rockhampton for port facilities. Whilst the 1930s were hard times for both seasons and wool sales, war time and postwar sales brought unprecedented prosperity. Fire had destroyed two North Gregory Hotels, and the third one was burnt down in 1946. Although there were three other hotels, the town's people wanted the "first class" hotel replaced. The shire council got special powers to build and run a fourth new Gregory, and the 1950s wool cheques supplied the loan funds for a modern all brick and masonry building (1955). Wool cheques also funded a swimming pool (1956) and town sewerage, and the 1950s ushered in a CWA students hostel, a bowling green, an RSL hall and three new motor garages. Winton's "golden age" lasted until the mid 1960s, when there was drought and a fall in wool prices. A tourist promotion association was formed in 1966, and the Qantilda folk museum was opened in 1972, just as wool needed rescuing by the reserve price scheme.